A lot has been said and written about friendship over the years, much of it unbearably sappy. Of course, friends mean a lot to us, and there’s a time and a place for those mushy expressions of BFF love. But there should also be a time to celebrate the fun side of friendship – the laughter, the good times, the glorious, goofy hijinks. To that end, we’ve collected, in one place, some of the funniest things ever said about friendship. 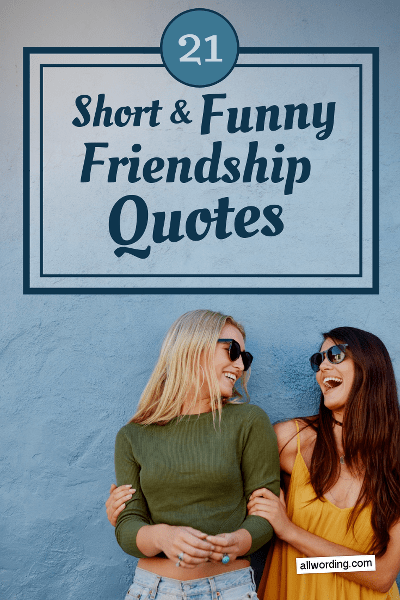 These short and funny friendship quotes aren’t just for laughs, though – they also offer some revealing insights about what it means to be, and have, a friend. Enjoy these hilarious sayings as you think about your own crazy friends. If you enjoyed these humorous friendship quotes, you might also want to check out our lists of Skittles puns and candy bar sayings. A little gift with a punny saying is a perfect way to brighten a friend’s day.